It was the reason, in 1974, that Mahurangi Action was formed. 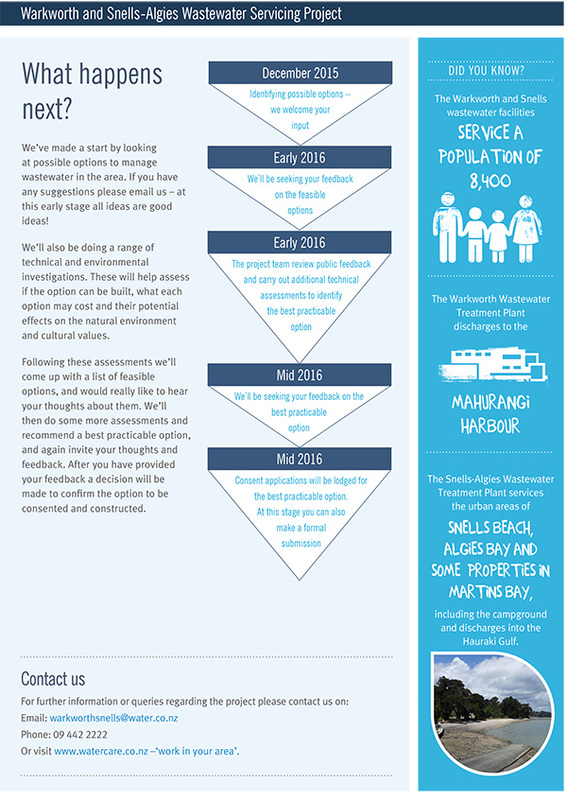 The Warkworth Town Council was forging ahead with long overdue long-term plans for its wastewater treatment, without a skerrick of consultation with the community, much less the Mahurangi oyster farmers downstream. In 1974, there was no pretence of consultation, simply a period in which entities deemed to have a legitimate stake in the outcome could object to the granting of a water right—to discharge, in this case, effluent into the Mahurangi River. The community was given little time to respond, hence the meeting to form an interest group being convened a frantic eight days before Christmas. 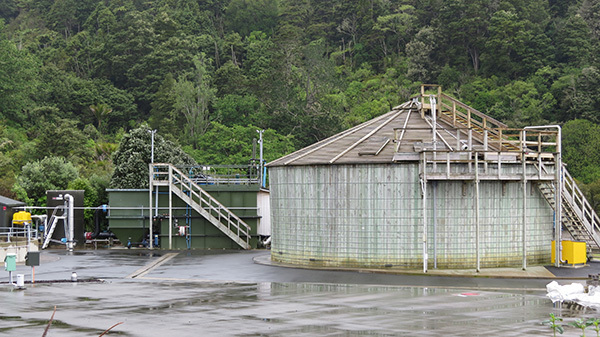 There was no question that the new wastewater treatment plant planned for Warkworth was going to be a considerable improvement on the town’s two municipal septic tanks that provided scant treatment for the sewage, with most of the work being left to the Mahurangi River. It was the style of the treatment proposed that worried many, notably the town’s potable water treatment plant operator, Wilfred J D Allan—WJD Allan, as he signed the many technical books he authored, also coined Mahurangi Action’s original name: Friends of the Mahurangi. Instead of then-default passive oxidation ponds, Warkworth was to have a plant that worked on the aerobic principle, but made up for its diminutive pond size by mechanically aerating the wastewater. Of the two great downsides of the system—high electrical energy use, and this was in the thick of the first oil shock, and poor capacity for elevated peak flows—it was the latter that worried Allan and Mahurangi’s oyster farmers most. Warkworth’s sewers were infamously leaky and acted as storm-water drains, even where storm water wasn’t directly, illegally plumbed into the reticulation. In periods of high rainfall, raw sewage would erupt from manholes in the town’s main street and flow into the river via the storm water drains, bypassing any pretence of treatment provided by the civic septic tanks. The plant’s designers were upfront about the implications of their plant, referring to the section of the Mahurangi River downstream from Warkworth as ‘the buffer zone’ that was to provide the final oxidation at times when rainfall prevented adequate treatment in the so-called Pasveer ditch—not Dr Pasveer’s actual design. This plan put paid to any expectation that the river might be restored for uses such as water-contact recreation, and posed the very real possibility that during a fresh, pathogens would be swiftly carried well downstream in a lens of freshwater atop the saline harbour water, all the way to the oyster farms. Acknowledging the potential impacts on the receiving environment, the then Auckland Regional Authority set up a special tribunal to hear Warkworth’s application for a water right to discharge. Allan presented screeds of well-researched argument, and Mahurangi oyster farmers retained the silver-tongued lawyer Ian Cowper, famous for his work with the Environmental Defence Society. What appeared to be the most obvious need was to combine the treatment of Warkworth’s sewage with that of the rapidly growing Snells–Algies coastal settlements, on the Mahurangi Peninsula and to discharge the effluent beyond the Mahurangi Harbour, rather than into its enclosed and marine-farmed waters. In November 1975, the tribunal agreed, and the Warkworth Town Council was required to work with Rodney County Council to that end, the tribunal noting the national importance of Mahurangi’s oyster industry, which at that time was the principal source of oyster spat collection for growing areas from the Bay of Islands to Coromandel. However, entirely reasonably, the tribunal had provided Warkworth with the right to go it alone, should Rodney County Council not proceed as anticipated, to cater for future growth of Snells–Algies by building a wastewater treatment plant to replace the developer’s existing small ponds. Rodney County Council colluded by issuing a statement that it had no plans to proceed with the building of any new plant. Thus Warkworth was granted its water right, where upon the county promptly announced it was going ahead with its own, independent plant. The cynical move proved to be short-sighted, and within a short period of time both councils were amalgamated and the new Rodney District Council was saddled with a Warkworth plant that proved to be expensive to operate and one that would periodically fail to comply with its strict water right conditions, and a Snells–Algies plant that cost vastly more than anticipated when its outfall, rather than be poked into the Mahurangi—short-term, of course, is how the council characterised this roundly rejected offer—was chased farther and farther along the peninsula to its current location south of Martins Bay. 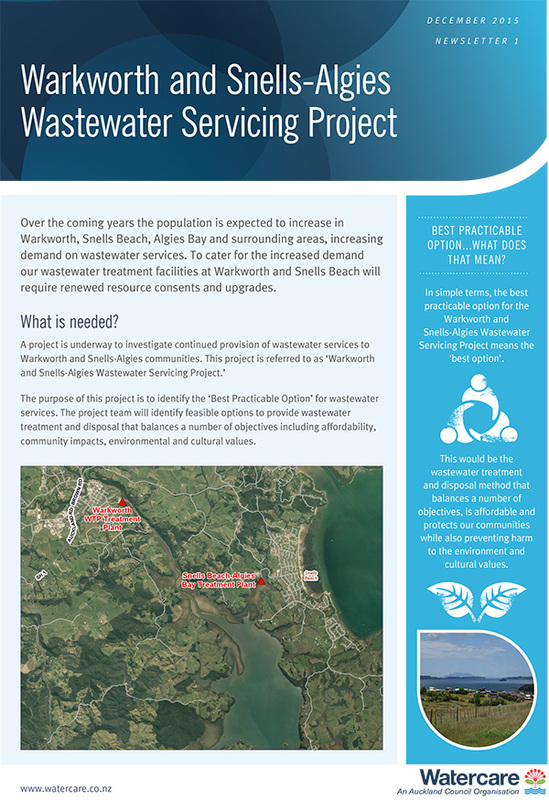 A project is underway to investigate continued provision of wastewater services to Warkworth and Snells–Algies communities. The signals have consistently indicated that the wastewater planners are inclined towards a combined facility servicing Mahurangi’s wastewater located at Dawsons Creek as providing the best prospect for servicing the volumes projected in an environmentally and economically sound manner. Seeking feedback on the best practicable option. Once the consent applications have been lodged, formal submissions can be made. As with all such processes, the further the consultation period advances, the more the opportunity for the community to influence the outcome tends to diminish. There is much to commend an early knockout blow, such as the one delivered by the community in favour of walking access to Te Muri, in 1987, as opposed to a proposed road from Mahurangi West, and road bridge across Te Muri Estuary and parking for 2000 cars there. However, such examples of official volte-face are rare, and it is a fortunate community indeed that finds its conclusions about what constitutes the best practicable option coincide with those of its council. In the spirit of the T E Lawrence’s dangerous dreamers of the day, the servicing of wastewater could be seen as an opportunity advance numerous Mahurangi Action Plan objectives. Picture if you will a Mahurangi River boardwalk extending from Warkworth to Dawsons Creek that supports a polyethylenewriter showing his age!—orginally published as: PVC pipeline cleanly carrying the wastewater that currently flows down the same river. Infrastructure such as this that encourages walking and cycling does more to address noncommunicable diseases than any other health intervention short of a sugar tax, and would fuel a visitor bonanza. Although the six-kilometre distance involved may sound significant, it is somewhat shorter than the recently upgraded line that already conveys treated effluent from Dawsons Creek to south of Martins Bay, for discharge off the coast there. Presuming that the line would be constructed on approximately the same alignment as a Warkworth–Snells Beach walkway, burying and maintaining a main through mud and mangroves would be costly and problematic, whereas a polyethyleneas above, the writer was showing his age—orginally published as: PVC pipe slung under a boardwalk, infinitely accessible. The current wastewater treatment plant at Dawsons Creek consists of tried-and-true, low-energy-use oxidation ponds. Ponds can be shrunk, as per Warkworth’s, but the downside is all that electricity needed to provide the natural aeration, including that from wind action, on larger ponds—not to mention the reduced opportunity for natural disinfection by sunlight. Further, the economies of scale of a combined Warkworth–Snells–Algies wastewater treatment plant make it more likely that the anaerobic digestion of biosolids—long since routine at the Mangere Wastewater Treatment Plant—might create sufficient biogas to render the Mahurangi operation energy neutral. The projections for the end of the century are much more uncertain than those for the middle of the century. Uncertainty grows over time. Be that as it may, for any new infrastructure to have any guarantee of lasting 40 years it better have at least an extra metre of freeboard, or be designed to float. Here, another Mahurangi Action Plan project might be profitably combined—the navigational dredging of the Mahurangi River. The costly component of dredging is the deposition of the dredgings, as is currently being demonstrated by the Sandspit Marina project where the material is being carted beyond Colville Channel, at ruinous cost if not to the project now or in the future, certainly, accumulatively, to the climate due to the fossil fuel burned during that 200-kilometre round-trip tow, and the receiving waters absorbing the plumes of sediment. If instead, the navigational dredgings and those from over-silted oyster farms were used to future-proof oxidation ponds, and reduce the dumping impact of dredgings, it would appear to the at least a win-win-win. Because a channel would need to be dredged to access the deposition site, the navigability of Dawsons Creek would be restored—its silting-up was hastened by early, less-than mindful oyster-washing operations there—opening up the prospect of a town basin being created for Snells Beach, and a shore depot for Mahurangi oyster farmers. Now is the time to call for ‘the best practicable option’ to include some deliciously dangerous dreams.